Latest News on When will Anna University UG PG Results April / May 2019 exams has been declared for 2nd, 4th, 6th, 8th Sem Current/Arrear on coe1.annauniv.edu portal. The upcoming result is for 8th sem, 6th sem, 4th sem & 2nd semester students and is scheduled to be completed by June 2019. According to the informations being shared by news portals, Anna University results to be published July 3rd week 2019, keep this page checked. 2 How to Check Anna University Results? 2.1.1 How to Check Result on Anna University WLX App? 6 Why Anna University website is Slow / Not loading ? 7 Why Anna University Results Delayed ? Students who’ve appeared for the April/May 2019 ( 2nd, 3rd, final year ) and ( 2nd semester ) exams would be able to check results in the month of JULY 2019. As per NewsX report, Anna University Result for Undergraduate/Post graduate students of Nov Dec exams be declared on January 12, 2019. More than 2.5+ lakhs students have appeared for the University examinations conducted across the state in 500+ affiliated engineering colleges to Anna University. The time table for nov/dec exams was released in the month of September 2019, and many were asking if there’s any changes during the cyclone Gaja. Every year, the result for Nov/dec examinations gets published during the first week of February or in some rare case pushed to March 1st week. But past few years have seen a surprising events of Anna University releasing its results much earlier than what it usually did. In 2009,2010, 2011, anna university has taken more than two months to announce the result and the servers were not as powerful as how it is today. Due to continuous backlash from students community, and colleges, Anna University somehow improved their infrastructure to smooth release exam results on its portal. How to Check Anna University Results? Goto Address bar, enter Anna University COE Results portal or you may directly goto the page from the link given in this mykalvi article. 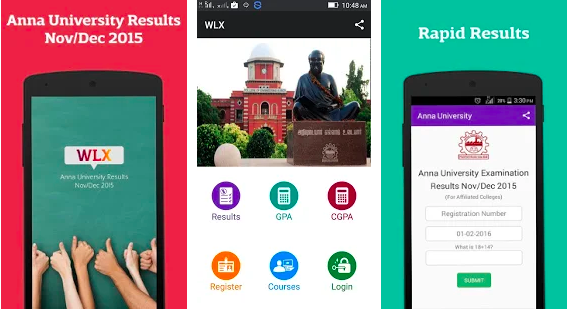 Another most easiest way to get Anna University exam result is through mobile app, all you’ve todo is install Anna University WLX app once and you’re good to keep it as long as you complete your studies. How to Check Result on Anna University WLX App? Unfortunately, WLX App is available only for Android Phones. Ever since the app got released on Play Store, a lot of students have been repeatedly asking on when will WLX app be published on Apple App Store ? Though the app is said to be more fast than web portal, sometime students still facing slow loading of results. The more the number of students use WLX App, the better the website will be for students to check exam result. In Tamil Nadu, the number of students pursuing Under Graduate Courses are always higher in numbers. It’s, not only for Arts & Science and Other degree programmes, but also for Engineering degree programmes. Of which, a majority pursue B.E courses, the number of courses under B.Tech is very less compared to B.E. Also many colleges have cancelled many B.Tech courses for example B.Tech IT, and it’s not being offered. Those who pursue U.G B.E courses have a total of 8 semesters to complete in 4 years. One would face two semester exams every year ie) Bi-semester pattern. Each semester has 6 subjects for Theory exams. 3-4 subjects for Practical Exam. Semester exams are conducted in April/May and November/December months as EVEN & ODD Sems. As soon as the exams are conducted for april/may or nov/dec, the results would be published within 30-45 days after completion of examinations. For those who couldn’t clear the current semester would get a chance to reappear in next semester exams, so every result release would allow students to check their current + arrear exam results. Which Semester Results Can i Check in Nov/Dec Exams ? Which Semester Result Can i check in April/May Exams ? So, if you’ve completed Nov/Dec exams, you will be able to check Odd Semester exam results in the month of Jan/Feb 2020. Though the number of students pursuing P.G is not as high as U.G degree programmes, still a lot of students have been showing interests in taking up M.E/M.Tech courses. Here the semester exam pattern is same as the U.G, but for two years. There are total 4 semesters a P.G student would need to complete and the last semester is fully of Practical. What are various P.G Courses to get Nov/Dec Exam Results ? Students who pursue 2nd/4th would be able to check their April/May result, and the 1st/3rd Semester PG result would be for Nov/Dec 2019 exams. A few years ago, Anna University used to release U.G results first, then after few days/week P.G results was declared. But last few years, both U.G & P.G results are being declared simultaneously. So students no need to wait to get their PG exam results. As soon as you see news on Anna University results been published, you too can go ahead get your results checked. Not only Full time candidates would be published, the results will all be available for the Part Time students as well. Only few colleges/campus provide Part Time engineering courses in Tamil Nadu under Anna University. All those students may check Anna University Part Time Exam results 2019 on the day of release of Regular/Full time exam results. The web link is same as well. What is Arrear exam ? As mentioned above, if a student failed a subject in semester 1, he gets another chance to reappear for the failed subject in Semester 2 exam, if he again gets failed in Semester 2, he get another chance till he get passed. So, if a student failed Maths 1 in SEM 1 of Nov/Dec/Jan 2019 exams, he gets another chance to reappear in April/May 2019 exam to clear the subject. The cyclic continues, and there are many students who’ve completed 4 year courses but still have arrears. There are thousands of students now requesting Anna University to extend last chance to appear for Anna University semester exams. Though AU allowed students to appear for Special Arrear exams in February & August, there’s no informations on Special arrear exam for Nov/dec 2019/ Jan 2020 session. So, why am i referring this is, if you’re still in 1st, 2nd, 3rd or 4th year, please do make sure you complete your arrears within 4 years period. Without a degree certificate, you will find it very difficult to get a job. Nowadays even those who’ve got good percentage faces issue of unemployment. Which Semester Arrear exams be released in JAN/FEB 2019 Result? Those who’ve appeared for any even semester arrear papers would be able to check their exam result. Anna University releases both Current & Arrear papers simultaneously, so you will be able to check your current+arrear papers at the same time. Anna university conducted Special arrear examination in the month of February & August 2019 for students who’ve crossed maximum limit of appearing for examinations, for which the results has been published. Those who’ve appeared for the Feb 2019 Special arrear exams were already released the results. And the August special exam results was released in Oct 2019. Many were asking whether there will be permission or if students would be allowed to appear for Nov dec exams 2019. But unfortunately there’s no official news on the same. Why Anna University website is Slow / Not loading ? It has been one of the most asked questions by Students than about the result itself, every single time it happens. Whenever Anna University publishes results, there’s always the issue of “website not loading” or “very slow loading” of the coe portal. Whether it is for Anna university regular results or review results, the state of Anna University website remains the same. It not only gives poor user experience to the students, but irritates / frustrates since they would be very eager with huge anticipation to know their results status. To remind you, It’s not something new faced by Anna University & its affiliated college students. It’s been the happening right from 2007, still there seems to be no proper infrastructure upgrade taken by Anna University to improve its server performance during its peak usage. Huge number of students trying to access the website simultaneously, ie) Higher Concurrent Users. The more users try to send request to the server, the more resource it consumes and so the more load to the server / CPU. If the server is more capable of handling the possible user requests during the time of release of Results, then it will be a smooth experience for everyone. When Anna University can earn crores from the fee collected for Anna University revaluation application, why not they spend some money on upgrading servers? Whenever we get to know the results are to be declared on particular day / date, we try to update as early as possible. As soon as students get notifications regarding Anna University released Nov/Dec 2019 result they immediately try to open up Anna University Coe portal. If you are unable to access the Anna University COE portal site right now, the single advice we say all the time is to wait patiently for few hours to let the server be free from rush, then you may be able to check your results with ease. At any time the number of students anticipating the result is more than 6 lakhs, so when everyone try to check result at the same time, it jams the web server and results in crash thus restricting students from checking their result. Why Anna University Results Delayed ? Again, its another most frequently asked questions from students, why anna university not released the nov dec 2018 result ? or why the delay ? Anna University results 2019 are to be released by Controller of Examination ( COE ), after a huge process of Paper Valuation, Verification, Computer Data Entry & Releasing on the official anna univ portal. While it takes some more time to release for April/May exams, for Nov/Dec exams, Anna University releases the results at least before February 2nd week. There are various factors contributing to the delay in publishing of anna university exam result 2019. Will Anna University Nov/Dec 2019 Result be Released in January 2020? We’re not sure yet, No One in fact. But we expect the Anna University result would come out after Pongal holidays 2019 or just before February 1st week 2019. If you’ve any questions or doubts regarding Anna University exam results 2019 for the recently completed November/December 2019 & January 2020 1st semester exam result ? Do post it on comment section.